If you've never been to Lake Tahoe, do make a plan to get there. To see this beautiful lake in person is a memory you'll treasure forever. Her exquisite beauty and breathtaking vistas are staggering. Once home to the Washoe, this land and lake has been transformed to suit our modern day needs. 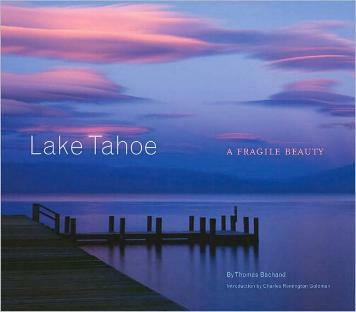 Says photographer Thomas Bachand, "Urban sprawl, regional air pollution, a growing appetite for recreational opportunities, the specter of global warming — in many respects, Tahoe is a case study in America's challenge to manage consumption pressures while sustaining the environment." The clarity of the water in Lake Tahoe is legendary, but even this is diminishing because of many factors. I loved reading Mark Twain's Tahoe experiences. The many photographs display the seasons and the incredible beauty of this area. Even though the water is losing clarity and the algal growth continues and pollution continues to increase and endanger the surrounds, the lake and forests can still be enjoyed and revered, for now. Mark Twain says the lake is 1,525 feet deep at its center. I was surprised that statistics were not given — for interest sake, I looked these stats up: Length is 22 miles; Width is 12 miles; Shore Length is 71 miles, and Elevation is 6,225 feet. Conclusion - A beautiful tribute to a beautiful place.